When installing RealPlayer, I get the error message "something has gone wrong while running msiexec" -- how can I complete the installation? To resolve this issue, try installing RealPlayer in Safe Mode. Step 1: Run the computer in Safe Mode. 1. Right click over the Windows icon at the bottom left corner of your computer screen. 2. Click on Run. In the search box type "msconfig" (without the quotes) and press Enter. 4. Click on Safe Boot, then under that click Network. This will cause the computer to reboot and launch in Safe Mode with Networking. 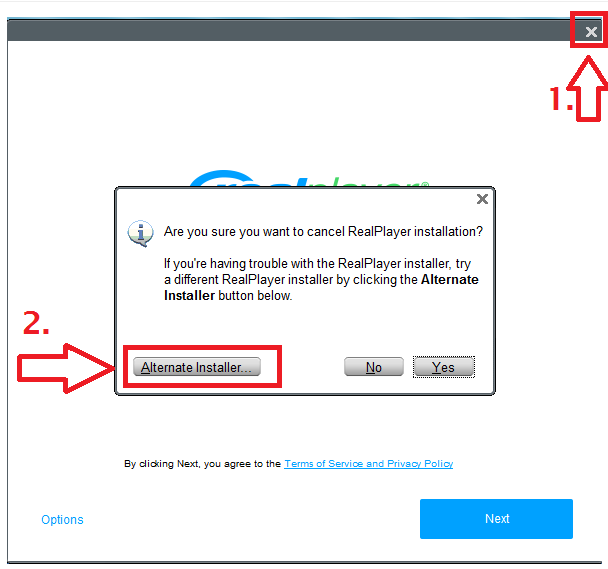 Step 2: Install RealPlayer using the Alternate Installer. 1. Click the X at the top right corner of the window. A smaller window will pop up. Step 3: Return your computer to Normal Mode. 1. Right-click on the Windows icon at the bottom left corner of your computer screen. When you click the OK button, you will be prompted to either Restart the computer or Exit Without Restart. Click the Restart button. This will shut down the computer. When it is back up and running, you will be back in Normal Mode.